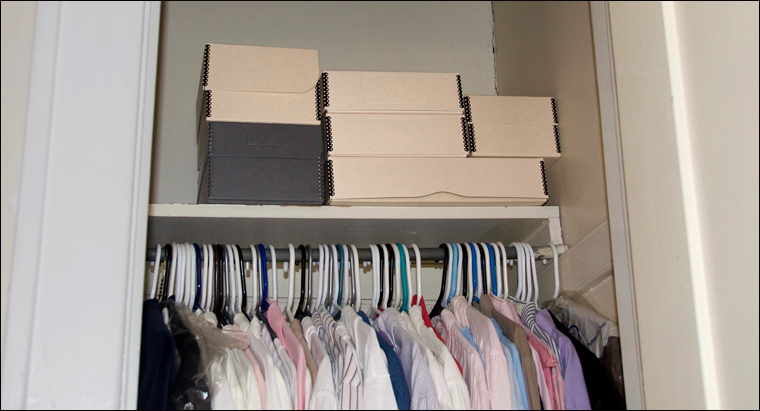 in your home or office, avoiding the many risks associated with storage in basements & attics. 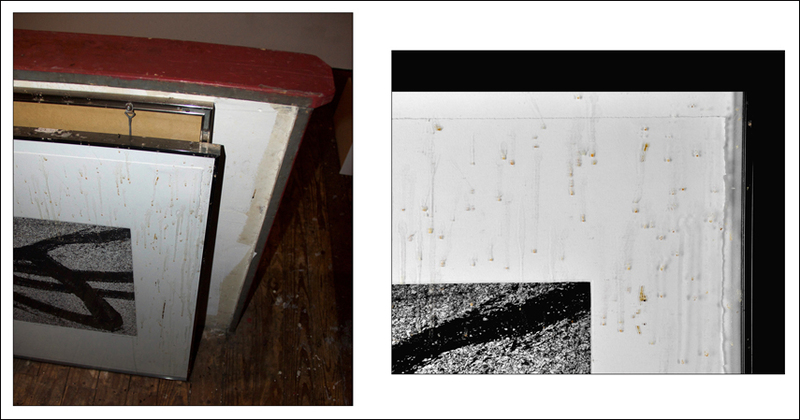 This is something that can happen to anyone (see photos above)—an old corroded water shutoff in a basement ceiling leaked onto a storage shelf and into a box filled with old photos & family photo albums. 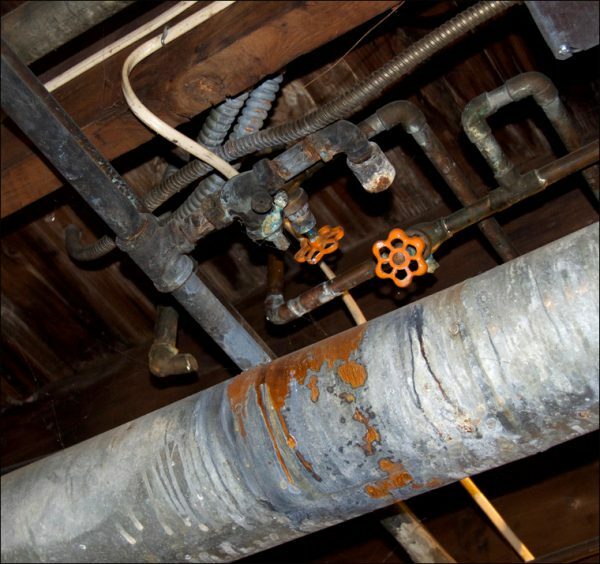 All of these hazards are in addition to the constant and potentially damaging temperature & humidity fluctuations that plague most basements. The lower the temperature the longer your items will last, because cooler temperatures slow the rate of chemical decay and reduce insect activity. Keep the temperature below 75 degrees Fahrenheit (F). 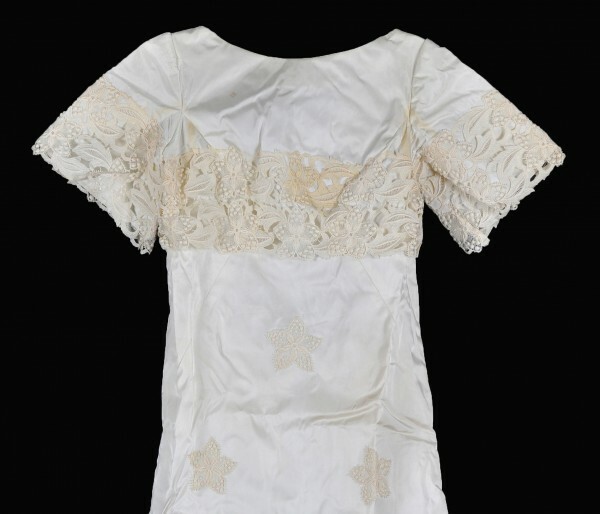 Yet the basement is not the only household storage area that can harbor threats to old photos, heirlooms, wedding dresses & textiles, books, and even archival boxes specifically made to preserve such collections & artifacts (see photo below). 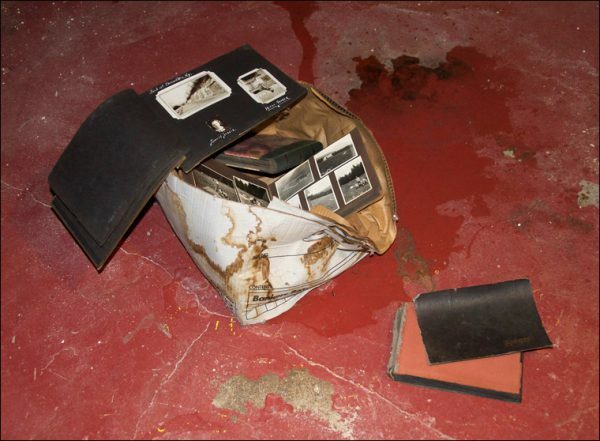 This archival Drop Front Box, stored in an attic, suffered the results of a leaky roof gable. 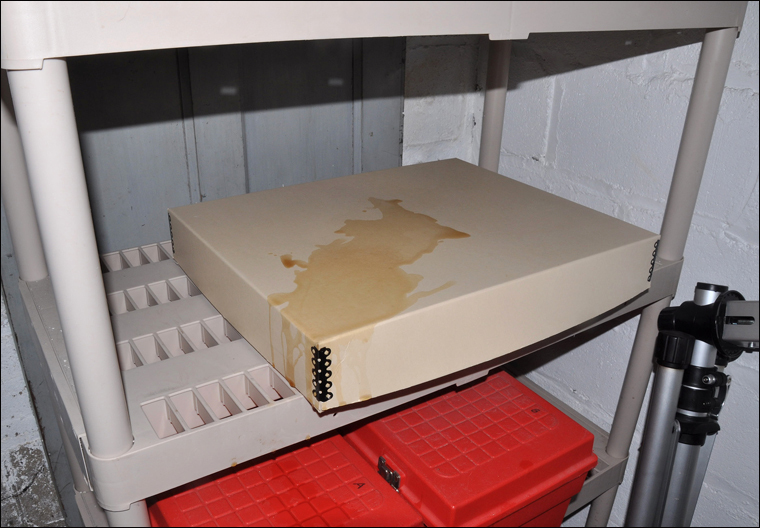 Yet water damage is just one of the potential threats posed by attic storage. In addition to the significant temperature and humidity fluctuations that, like basements, characterize most attics, on occasion other hazards exist—as in the case above that was caused by a family of bats. 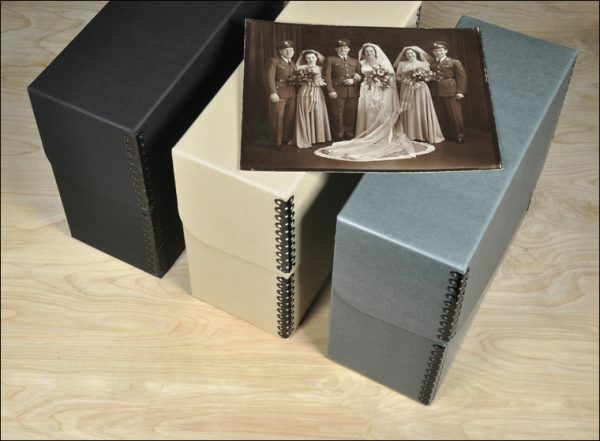 The “best practice” for handling important old photos, heirlooms and family archive materials is get them out of basements and attics as soon as possible and store them in the types of boxes & enclosures shown below. 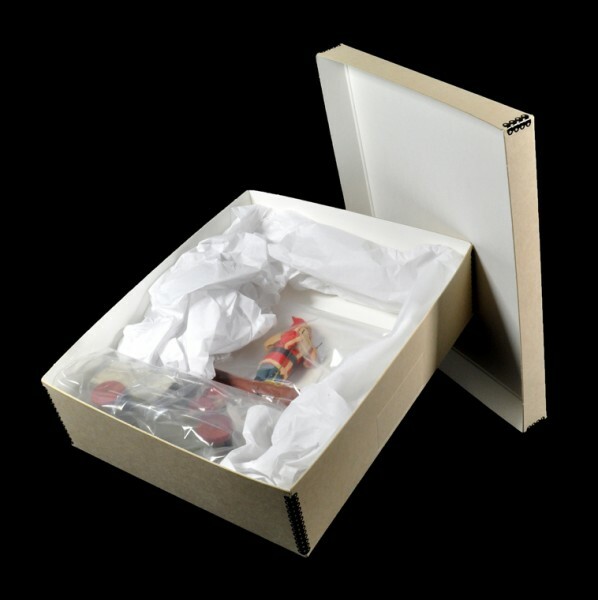 Once archivally secure, place these materials on a shelf or in a closet in your “living space” where the risks of water damage and wide temperature & humidity swings are significantly reduced. 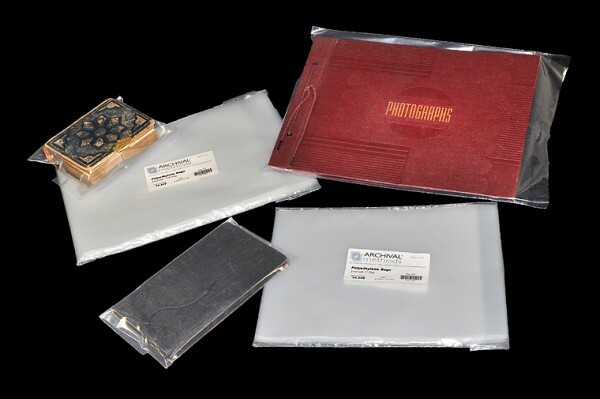 For family photo albums, consider placing them in Polyethylene Bags and then into Drop Front Boxes, which come in an assortment of sizes / colors and depths to match your tastes and the decor of your living space (see photos above). 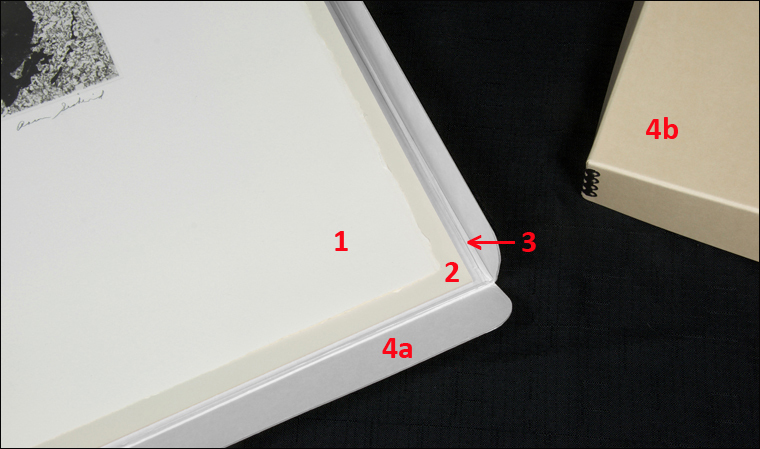 Options for preserving individual old photos include placing them in acid-free 3-Ring Binder Pages and Archival Binders (see the images at the top of this blog), or in acid-free File Folders and then into archival Document Boxes or Record Storage Boxes, as shown in the photos below. 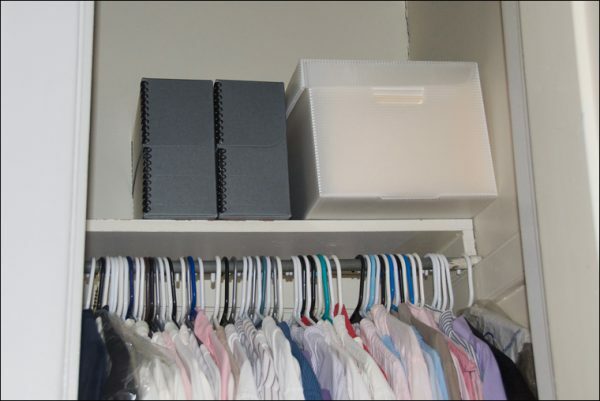 For wedding dresses, old textiles, quilts, military uniforms and baby clothes—which, unfortunately, are frequently stored in attics and basements—consider moving them to your living space in an all-in-one Textile Storage Kit (see right-hand photo), and whatever assortment of additional Archival Boxes and Archival Tissues will best fit your needs. Many of us have saved old toys from our own or our kids’ childhood, or perhaps have a variety of antique Christmas ornaments in the family archive. 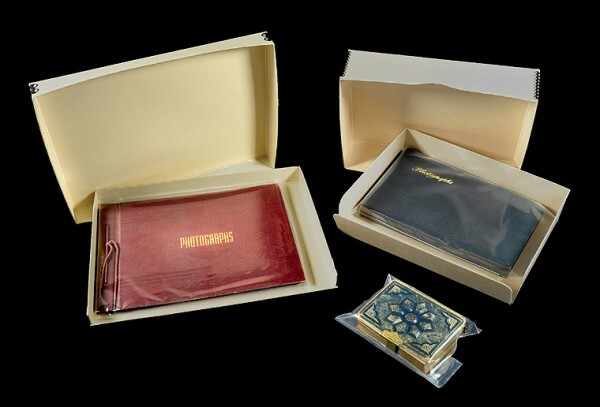 These can be easily stored in Polyethylene Bags, cushioned with Archival Tissue, and then placed in appropriately-sized Metal Edge Boxes and Artifact Boxes. 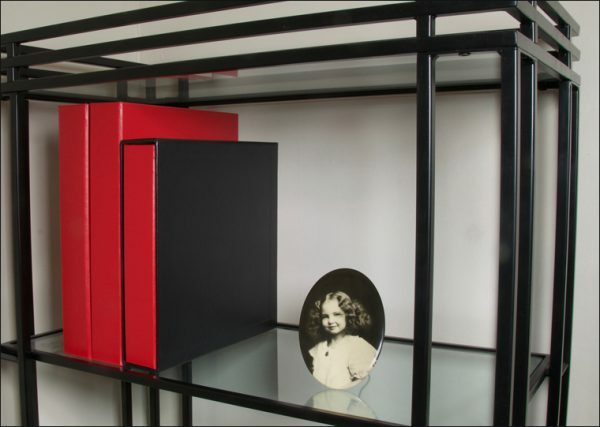 This “multi-layered” approach to archival storage offers the greatest protection for such heirlooms, all of which can then be safely stored within easy reach in one’s living space. 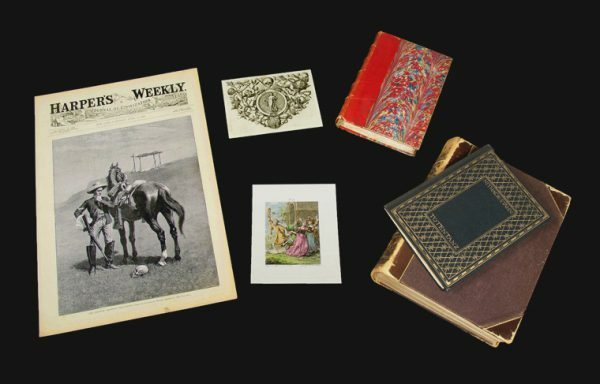 Old magazines, newspapers and books occupy an important niche in many family archives or collections. 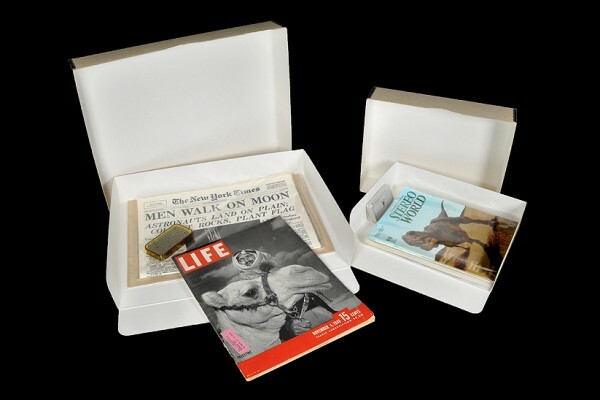 To protect these artifacts and heirlooms consider all-in-one Newspaper & Magazine Storage Kits, which are available in a number of formats, and various sizes and styles of Polyethylene Bags, Enclosures, and Metal Edge Boxes to match the size and shape of your materials (see the photo below of these kits and boxes being correctly stored). 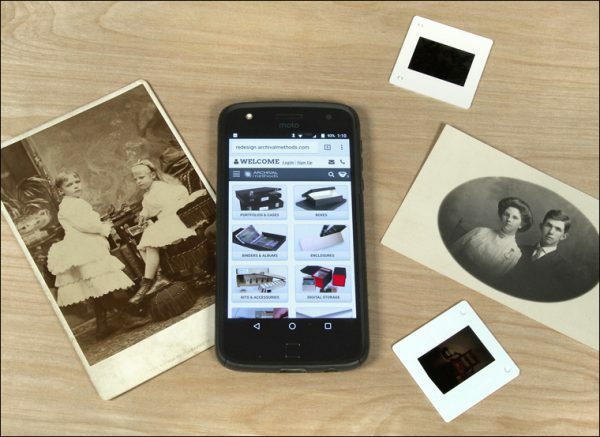 In closing, the broad categories above illustrate just a few of the many different types of old photos & family heirlooms that are often found in attics & basements. 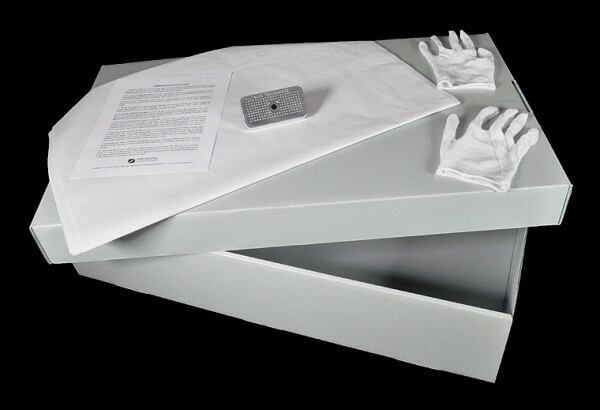 Combining the perfect archival product ensembles for your particular needs, and then storing these items in your “living space,” will offer the peace-of-mind of knowing that your materials are safe & sound for generations to come. 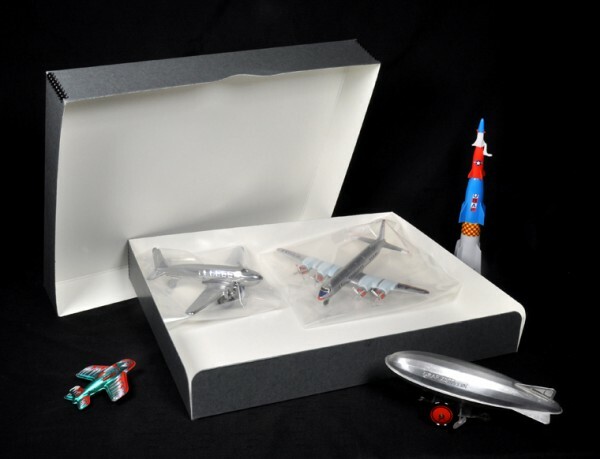 If you would like more information on the archival storage and presentation products that are right for you, please contact us here at Archival Methods. We’re always there to help with any archiving, storage, or presentation questions you may have. We would also like to encourage you to follow us on Instagram, Twitter, Facebook, Pinterest and our extensive series of illustrated blogs for up-to-the-minute information and links to stories of interest.